Did you hear that? That’s the sound of your prospect clicking off your product page. No sale. He’s gone. Your product interested him. It was valuable and would help him tremendously. So why in the world did he not buy from you? Your product description – it may have described the product, but it failed to sell it. That’s why I’m going to show you 6 critical mistakes behind feeble product descriptions and how to avoid making them, so you can create succulent product descriptions that seduce readers into buying. Want to know a quick way to slash the selling power of your product descriptions? Be mind-numbingly boring. You’ll have people rapidly clicking off your site and not wanting to buy. The Solution: Inject Life into Your Descriptions by Making Them More Human. Imagine that you’re at a car showroom looking for a new car. You’ve been browsing a while, and you’re approached by two different salesmen. The first one has an arrogant air about him. His suit looks pristine, his hair is impeccable, and he has a poker-faced expression when he talks to you. The second guy approaches with a smile and asks how you’re doing. He answers your questions honestly, shares his personal opinion, and speaks with passion. You’re most likely to trust and listen to the suggestions of the second guy, right? He’s more likeable, relatable, and human. The same applies to your product descriptions. No one wants to feel as if they’re reading bland facts spewed out by a corporate robot. People are more likely to listen and respond to your writing when they’re able to relate to you. 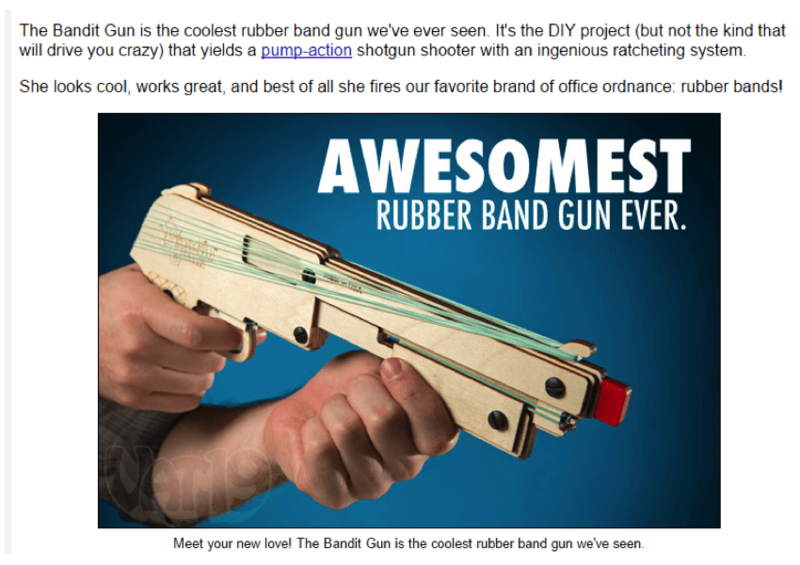 Here’s an example of a refreshingly “human” product description for Vat19.com’s rubber band shotgun. 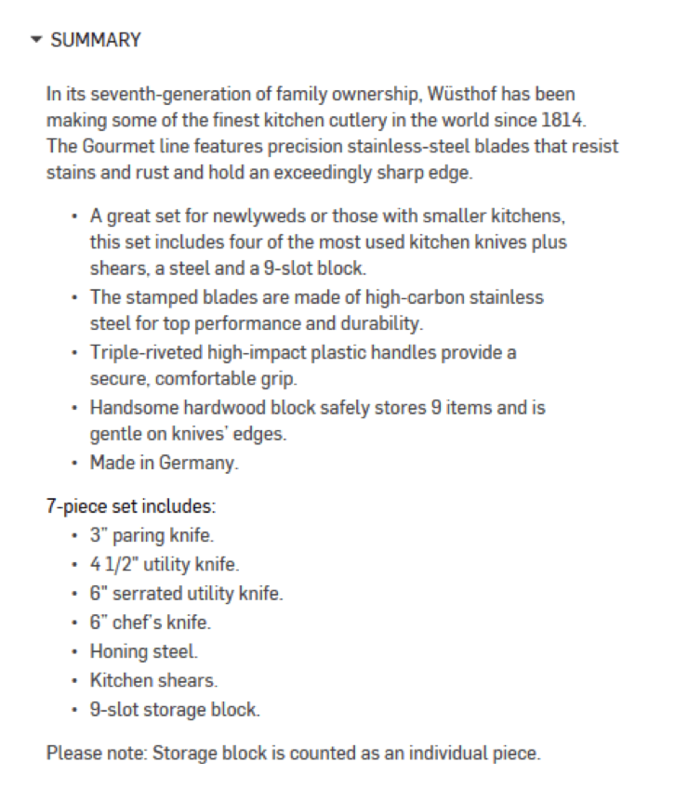 The product description is fun and playful. You can’t help but imagine yourself stealthily firing rubber bands at co-workers and taking cover while giggling at your desk. This description entertains the prospect, arouses his emotions, and instantly beefs up the description’s power by becoming more human. It’s short, punchy, straight-to-the-point, and uses “everyday” language that prospects can relate to, which ensures that it locks their attention in its jaws and quickly conveys its value. If you find yourself feeling a little “stiff,” imagine yourself talking to a friend (about your product) over a warm Starbucks. Your writing will instantly become more conversational and human. Another way to dilute the power and credibility behind your product descriptions is to expect prospects to believe and trust every claim. The truth is, people are always going to remain skeptical because they’re constantly being sold to, every day. Can you imagine the condition of someone who isn’t suspicious about the advertisements he encounters? He’d probably have to file for bankruptcy. The Solution: Combat Skepticism with Social Proof. TV shows often use a laugh track when a punchline is delivered. And even though the audience knows it’s a recording, it doesn’t stop them from laughing along with it. Street performers may chuck a few $5 bills into their tip jar instead of quarters or $1 bills to suggest that $5 is what everyone else is giving, which ideally increases the chance of others donating $5 bills. People might be skeptical about what you say about your product, but they’re likely to believe what someone else who’s used your product has said. That’s why social proof is an excellent way to cram more selling power into your descriptions. 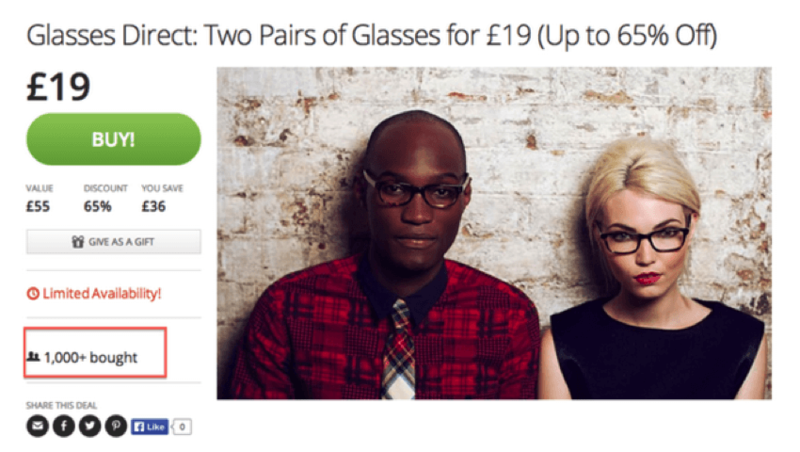 It makes it easier for people to buy the glasses, because everyone else has bought them. Here’s another example from the clothing store, SweatyBetty.com. When using testimonials on your site, be sure to use headshots (if possible) and add specific details like location, profession, and what product was bought (just like the SweatyBetty example). This will help boost testimonial credibility. If you want to guarantee your visitors do a 180 and run in the opposite direction, make your copy hard to read. People are usually shopping for quick cures and solutions. They’re in a rush to get what they want and fix their problem. Research by the NN/g Nielsen Norman Group shows that up to 79% of people scan when reading online. So it’s silly to expect them to wade through a swamp of text that’s so hard to read they might develop eye blisters. The Solution: Let Your Prospect’s Eyes Breath. 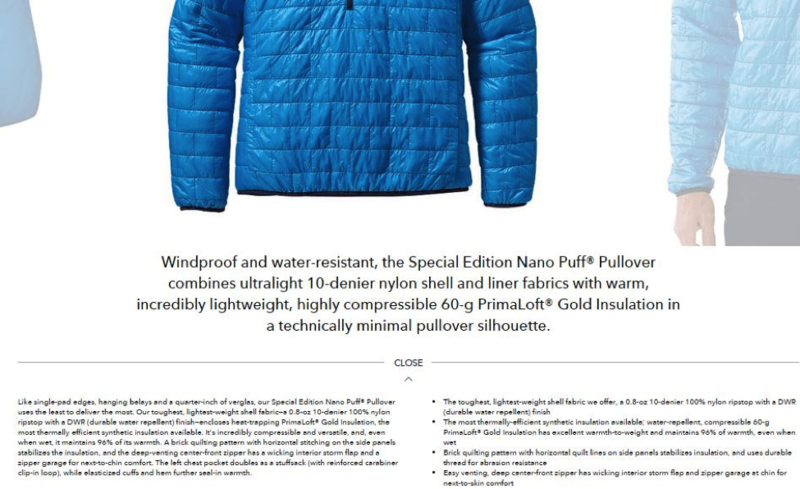 Take a look at the screenshot above for Patagonia’s Nano Puff Pullover. It’s a great example of a clear, easily digestible product description. There’s plenty of whitespace, which makes it easy to read. Important information is large and easy to locate, and bullet points quickly convey the benefits of the product. The problem is that when everyone out there is supposedly “super,” “revolutionary,” and “exclusive,” then no one is. Boastful buzzwords have saturated advertising, and people have become numb to them. They make your copy look salesy and dishonest. And thanks to their overuse, they’re as effective as a potato peeler in a gunfight. So it’s best to stay away from them. The Solution: Spice Up Descriptions with Specificity. Instead of making cliched claims, show how you’re “the most advanced” or “highest quality” with specific details. In the early 1900’s, Claude Hopkins catapulted Schlitz beer from number 8 in sales to number 1. At the time, all beer companies made boastful claims about how pure their beers were, every single one of them. But, in the ad that took Schlitz to the top, Hopkins specifically described how they purified their beer. The ad described how the beer was cooled in a special way that removed impurities, how magnificent the expensive white pulp filters were, how every pipe was cleaned twice for purity, and how each bottle was sterilized four times before it was trusted to hold the pure Schlitz beer. Compare that description with the simple statement every other company made: our beer is pure. You’re guaranteed to have more trust in the Schlitz ad, right? That’s the power of specificity. And online clothing store Zappos knows how to harness that power. Take a look at the description above. They could have easily said their shoe is “super comfortable” and that they’ve taken a lot of care. 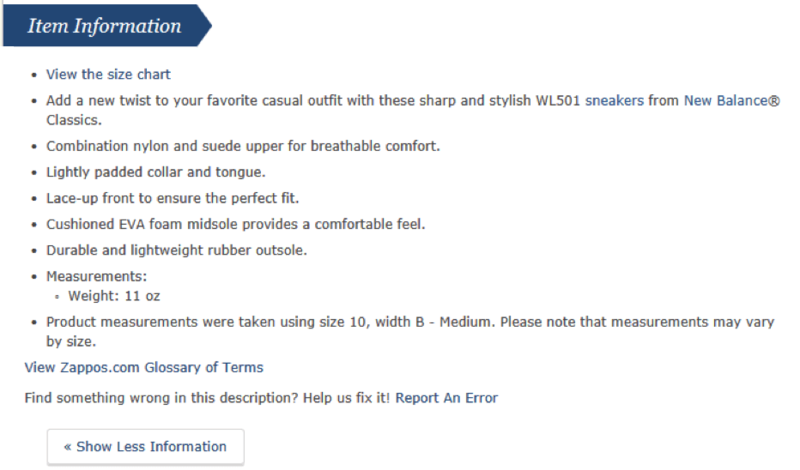 Instead, they’ve described specific features that make the shoe comfortable. This shows the reader that they “walk the talk” and aren’t just blabbering useless buzzwords. If you’re looking to spike the power and credibility of your descriptions, specificity is key. To sweeten your product descriptions with specificity, start by going through your descriptions. If you come across something that boasts without backing up, ask yourself what feature makes this claim true? Let’s say you sell office chairs. Instead of spewing out overused claims like “our chairs are extremely comfortable and tested for maximum back health,” talk about how your chair was designed by chiropractors for maximum back comfort and health benefits, how your seat and backrest are padded for sitting long periods of time, and how the chair comes with a pressure sensitive timer that goes off if you sit too long. Remember to also show. Don’t just tell. Throwing up a description of your product might make some sales. Building a description that shows (with specificity) how your product benefits your prospect is even better. But creating a description that becomes an emotional experience in your prospect’s mind… Now that’s how you’ll explode your sales. Unfortunately, that’s where most product descriptions fail. They simply describe their product and rarely back up their claims with specific points. The solution: Ignite Emotions and Create Powerful Experiences with Stories. Consumers base their buying decisions mainly on feelings and experiences rather than on the features, facts, and attributes of a product/brand. The more likeable an ad is, the greater the chance it will increase a brand’s sales. The emotional reaction to an ad has more influence on a consumer’s desire to buy than the content of the ad itself. And when it comes to arousing emotion, stories are the most powerful tool in your arsenal. Journalist Rob Walker conducted an experiment to test the emotional power that stories have on our perceived value of products. He hired a group of writers to create emotionally charged stories about unwanted, junk items from thrift stores. The items were then listed on eBay, each with its own story. The result of this experiment was that $128 worth of junk thrift store items sold for a whopping $3,612.51, an overall value increase of over 2,700%. Yup, thanks to the huge emotional punch that stories pack, literal junk was sold at insane prices. Imagine the effect that stories could have on your business. Now you’re probably thinking “that’s great, but it’s hard to incorporate stories into product descriptions.” So here are some examples to prove otherwise. 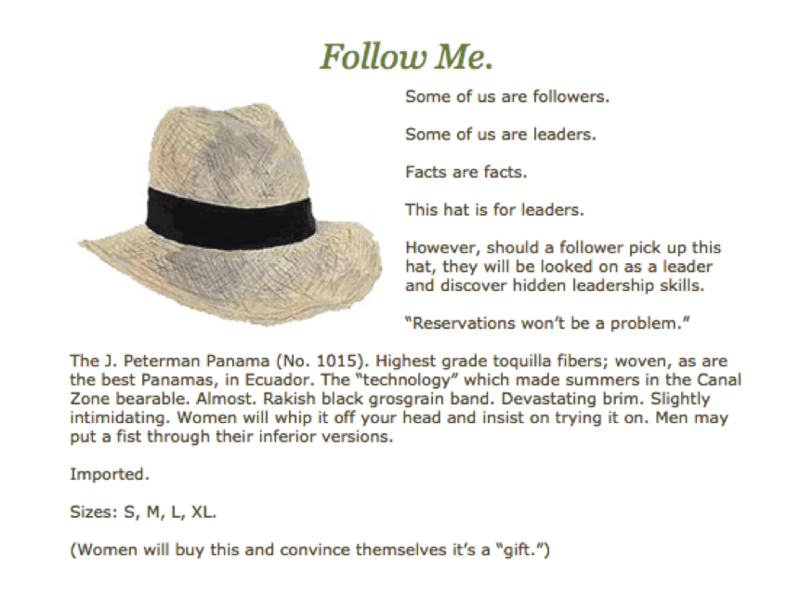 Peterman knows how to craft stories that sell their products like hot cakes. This description doesn’t just blindly describe the product. It forces the reader to imagine who he’s going to be wearing the hat. It helps him dream. It helps him picture success. It creates a mental experience that boils the reader’s emotional cauldron and makes him want to buy. This is a great example of storytelling because it weaves an intriguing story about the product that transforms it into something unique. It also makes the product more memorable and likeable. 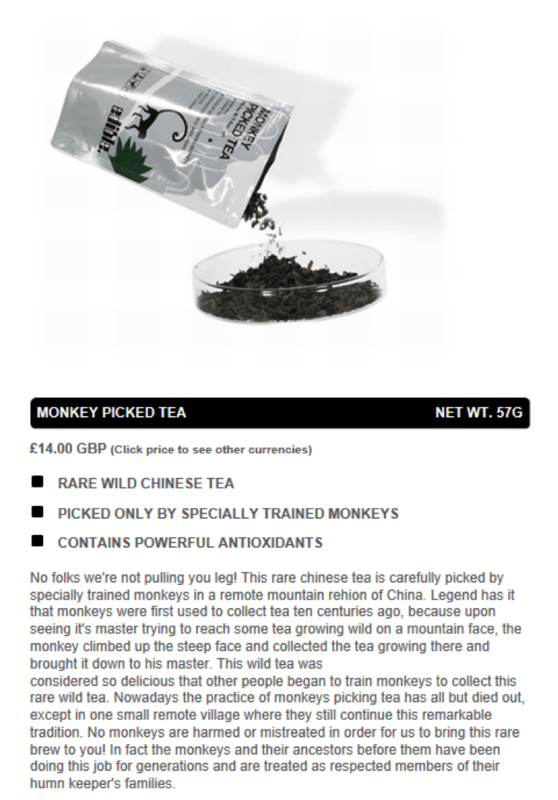 I mean who isn’t at least a little interested in monkeys specially trained to pick tea? Start by asking yourself about your product. Were there any difficulties you encountered when creating the product? Any noteworthy successes or failures that could be weaved into a story? Simply tell the story of someone who’s used your product and share their positive experience. It’s not fancy, but it’s still a proven way to convert more customers. Another killer mistake that plenty of product descriptions make is to just describe the features of the product. 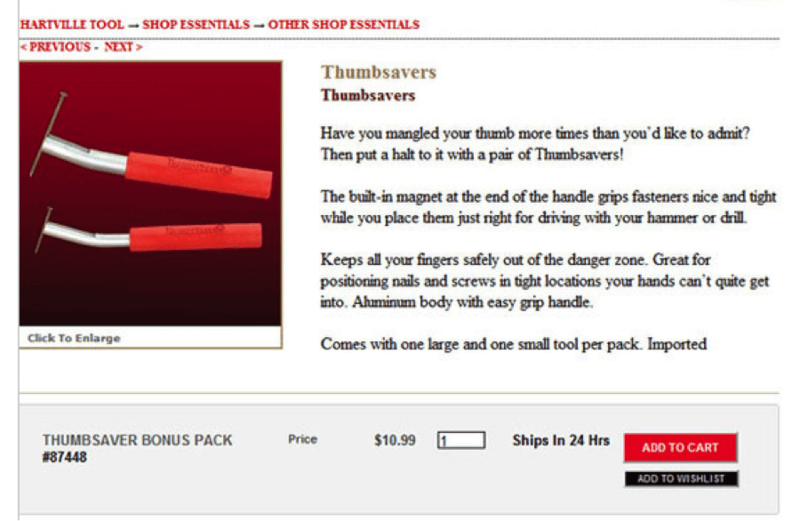 Most of us are so immersed in and passionate about our products that we become thrilled by mundane facts and features. But here’s the problem: your reader is deeply concerned with one special thing, and only one thing. What does your product do for him? Blindly listing facts/features doesn’t answer this question in a way that makes your reader want to buy. The Solution: Seduce with Mouthwatering Benefits. A fact or feature is just a detail about your product. A benefit, on the other hand, is how that fact/feature will help the person reading your description. Wrangler’s description tells its women readers exactly how each and every feature of the jeans will benefit their lives by instantly making them sexier, slimmer, and more fashionable. This simple benefit-driven list homes in on the interests and worries of most parents and cleverly conveys how the product will be a beneficial teething tool for their child. It doesn’t just talk about the product features. It describes how those features will make their child’s teething life better. Producing benefit-driven descriptions isn’t hard. An easy way to ensure you’re seducing your prospect with benefits is to use the “so what?” test. We know you’re busy. So we’ve included 3 audio CD’s you can use to learn how to market your business to dizzying heights while you drive around or do simple chores. Sometimes you need the answer ASAP. So we’ve included a 10-point checklist to help you quickly plug dangerous ship-sinking holes in your marketing. Marketing isn’t rocket science, but you still need to know what you’re doing. So we’ve included this short and sharp 60-page ebook to help you hit the ground running and avoid profit-slashing hurdles. One simply describes, while the other mentally takes the reader by the hand and gently presses the product into his palm, creating a vivid picture of how his life will improve. Applying the advice above will inject serious power into your products. But there’s still one more important step – A/B split testing your product descriptions. Switch up the style of your descriptions, and A/B test which one performs better. Do your readers respond to story-driven copy? Or are they more responsive to a straight-to-the-point, benefit-driven style? Maybe they favor conversational copy? The simplest way to begin testing on your ecommerce store is to install split testing apps. They might not be free, but ecommerce platforms like Bigcommerce, Magento, and Shopify all have them. You can also use Optimizely and Visual Website Optimizer. The bottom line is that constantly split testing product descriptions will give you a deeper insight into what appeals to your customers. You’ll also increase your conversions and slam down more cold hard cash in your pocket. It’s easy to slip into the trap of creating boring product descriptions that damage sales. But now you know the specific steps to take and mistakes to avoid when creating product descriptions that shoot up sales. What’s your biggest problem when writing descriptions for products? Tell me in the comments below. About the Author: Hassan Ud-deen is a freelance blogger and sales page / email copywriter who writes at www.f-bombmarketing.com. He’s on a mission to stomp out boring marketing. Ud-deen also helps businesses use content to explode their growth. Troll him on Twitter (he likes it), or email him if you need help with articles or copy.